Brec Bassinger has been cast as Stargirl for the new DC Universe series from Geoff Johns. 19-year-old Bella and the Bulldogs star Brec Bassinger has landed the coveted role of Courtney Whitmore a.k.a. Stargirl for the upcoming DC Universe series of the same name which is coming from one of the creators of the character, Geoff Johns. 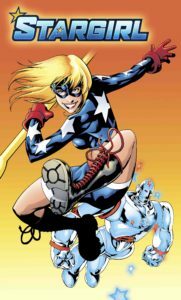 Courtney Whitmore (aka Stargirl) is smart, athletic and above all else kind. This high school teenager’s seemingly perfect life hits a major speedbump when her mother gets married and her new family moves from Los Angeles, California to Blue Valley, Nebraska. Struggling to adapt to a new school, make new friends and deal with a new step-family, Courtney discovers her step-father has a secret; he used to be the sidekick to a superhero. “Borrowing” the long-lost hero’s cosmic staff, Courtney becomes the unlikely inspiration for an entirely new generation of superheroes. “There is no other character in comic books more special to me than Stargirl, and after searching far and wide I can say there is no other actor on the planet that embodies her more than Brec Bassinger. Brec’s warmth, strength, humor and positive energy are core to who Courtney Whitmore is. I’m so grateful she’s signed on for the role,” Geoff Johns said in a statement. This isn’t the first time Stargirl has been seen in live action. Britt Irvin played the character on Smallville in the two-hour “Absolute Justice” which was written by Geoff Johns; she also appeared as a member of the Justice Society of America on DC’s Legends of Tomorrow where she was played by Sarah Grey. Bassinger’s other prior credits include Hulu’s All Night as well as guest star roles including The Goldbergs and Code Black. Geoff Johns is writing the first episode of Stargirl which also comes from Executive Producers Greg Berlanti and Sarah Schechter. The series is produced by Berlanti Productions and Mad Ghost Productions in association with Warner Bros. Television.